Diamond Care | Jewellery Education | John Anthony Jewellers Ltd. Bridal jewellery, such as engagement rings and wedding bands are typically worn daily, and can appear like they've lost their sparkle if not cleaned on a regular basis. Lotions put film on diamonds and reduce their shininess. Don't wear diamond jewellery while doing rough work. Avoid chlorinated pools and hot tubs. Avoid touching diamonds with your fingers, as smudges can affect a diamond's luster and fire. 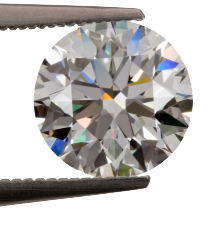 If you have questions, feel free to contact one of our diamond experts at John Anthony Jewellers, and we will be happy to provide all the information you need to help you keep your diamonds in great shape.